Welcome to the English website of the Department. 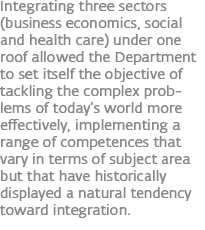 The Department is typified by its innovative character, resulting from the collaboration between diverse and complementary areas of competence: economic-business, health and social care. Applications open for degree courses Bachelor and Master in Business administration for academic year 2019/2020. This Bachelor aims to develop managerial expertise tuned to the industry and services sector associated with free time (tourism, sports, culture, events, entertainment), focusing to digitization, sustainability, ethics, interculturalism and innovation. In October has been published Iride's 5th edition about Digitalisation and its transformations in economic, social and health care fields, representing in this way different areas in a multidisciplinary perspective. DEASS invites people concerned to join in with Bachelor & Master's OpenDays, that will take place next February 2018 in Manno. An occasion to know the organization, have a close look on the programmes of study and talk face to face with the teachers. The SUPSI Executive Master of Business Administration (EMBA), XI edition, starts in September 2017 and finishes in June 2019. The enrolment process is now open. In January 2018 is ready to start the 5th edition of the Master of Advanced Studies in Human Capital Management. The enrolment process is now open. The 4th edition of the Congress, organized by the Department of Business Economics, Health and Social Care, has taken place in September at the SUPSI Trevano Campus, with a great participation of teachers and researchers. Conference "Economics, Health and Happiness "
The conference "Economics, Health and Happiness", organized by the Department of Business Economics, Health and Social Care, HEIRS and SSPH+, took place from 14th to the 16th of January 2016 at the SUPSI Trevano Campus. Go to the italian version website. The Department offers five Bachelor's courses within economic, health and social field: Business administration, Nursing, Occupational therapy, Physiotherapy (Manno, in italian and Landquart, in german) and Social work. The Department of Business Economics, Health and Social Care offers Master's courses in Business Administration (in collaboration with Fachkonferenz Wirtschaft und Dienstleistungen) and in Social work (in collaboration with Haute Ecole Specialisée de Suisse Occidentale).